If you have started seeing various commercial advertisements labeled as Featured Deals on such shopping websites as bestbuy.com, amazon.com, ebay.com, walmart.com, and others, there are no doubts that you have an advertising-supported application installed on the system. If you cannot remember downloading it yourself, there are basically no doubts that it has entered your system without your permission. In most cases, it is not difficult to detect and delete adware; thus, you will probably be able to do that yourself; however, if you need some more information about the removal of Featured Deals, you should read throughout the article. Featured Deals ads are not harmful themselves; however, unreliable links might be embedded into them and thus you might be taken to unreliable websites. In order to prevent this from happening, you will have to stop ads from appearing. As you might suspect, the only way to do that is to delete the program responsible for the presence of Featured Deals. Keep in mind that other undesirable applications might be present on the system as well; thus, you might still be bothered by ads. Therefore, it is necessary to detect all the undesirable programs and then delete them entirely. If you do so, you will definitely not see Featured Deals and other ads anymore. An advertising-supported application which distributes Featured Deals does not have its official website; thus, our security experts believe that it might use the method called “bundling”. It means that the program travels with other applications, for instance, freeware in order to enter your system. Unfortunately, various browser hijackers, suspicious browser plugins, and different potentially unwanted programs might slither onto your computer together with other programs as well; thus, we recommend being extremely cautious. Firstly, you should not browse unreliable websites or download software from them; secondly, it is necessary to make sure that the program is reliable before launching or installing it on the system, and finally, you should definitely install an antimalware tool on your computer. In order to stop Featured Deals ads from appearing on your screen, you should delete the program that distributes them. It might be a difficult task because malware tends to hide. Therefore, we advise you to save your time and acquire an automatic malware remover. There are plenty of them available nowadays; thus, you should choose the most reliable one. If you are interested in our opinion, we believe that SpyHunter is one of those tools that are worth investing in. Access the Metro UI menu and move your cursor to the bottom-right corner. Select Search from the Charm bar, enter Control Panel in the box and click OK.
Click on the software that you wish to remove. Select it. 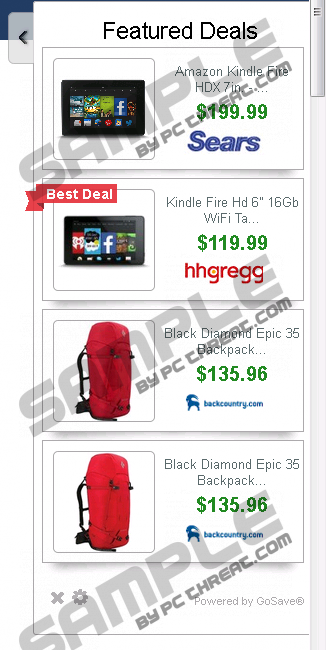 Quick & tested solution for Featured Deals removal.